After creating a detailed post on The Best Areas to Stay in Busan, I’ve had numerous requests to do the same for Seoul. So I thought it would be a good idea to put together a list of the areas of which I have stayed in, and give some info to help others make their decision. Most people when coming to a city for a holiday, have an idea of what they would like to see once they arrive (I guess some people who come for Business might not, but I’m sure this post will help you out anyways) and that plays an important factor as to where you should stay. For example, if shopping is the main reason you are coming to Seoul, 2 areas should be considered. The first being Myeong-dong, which I’m sure most people with an interest in Korea (specifically Seoul), would know or at least heard of before (if not, all good). The other shopping place is Dongdaemun which provides a lot of wholesale items and leather goods as well as shopping almost every hour of the day. Therefore, staying in one of these areas would be wise, as you can easily go shopping without having to catch a bus or the subway. Another thing to think about is if you plan on visiting a whole bunch of historical sites (or have specific sites you are wanting to visit) as this should be taken into consideration as you might want to stay centrally to those sites. The other factor is TIME….. if you are planning on staying in Seoul for a week or two, you can afford to stay in an area which is a little further away from the main sites/shopping areas (if you find a nice hotel or it is a little cheaper etc). If you are pressed for time and you would like to see and do everything, then you are going to want to stay in an area which is the most centrally located to cut down on travel time (buses, subways and taxis etc). Pretty much one thing springs to mind when someone mentions Myeong-dong…. Shopping. That is with good reason as Myeong-dong is the epicenter of shopping in Seoul. It has all kinds of shopping including clothing, skincare, shoes and accessories. 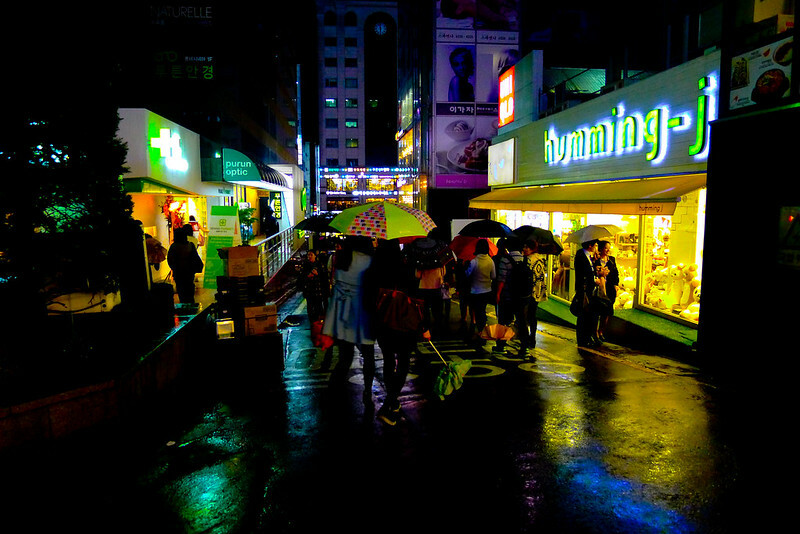 Myeong-dong also has a wide-range of Korean restaurants as well as foreign-based foods. You can also find the designer labels as some of the major department stores such as Lotte Department Store, Shinsegae Department Store, Migliore, Noon Square and M Plaza all reside here. Loads of shopping available at your doorstep. Popular area with a buzzing atmosphere. Fairly close to Dongdaemun (3 stops by subway). Close to Seoul Station (2 stops by subway). Close to Gyeongbokgung Palace (5 stops by subway with a transfer). Close to Gwangjang Traditional Market (4 stops by subway with a transfer). Close to Namdaemun Market (1 stop by subway). Close to Itaewon (Foreigner friendly area). Its super-busy, so if crowds aren’t your thing, maybe somewhere else is best. Very touristy (which can be good or bad i guess). Not the most authentic Korean experience. My thoughts: Myeong-dong not only has some of the best shopping in Seoul, it is also extremely central to the major sites. This I believe makes Myeong-dong a very good choice if you are planning to stay in Seoul. Although I do prefer Hongdae and Sinchon over Myeong-dong as I’m not much of a shopper, I would definitely recommend staying here if you are. Need help deciding where to stay in Myeong-dong? Below is a list of accommodation which I believe is best suited for all kind of travelers. 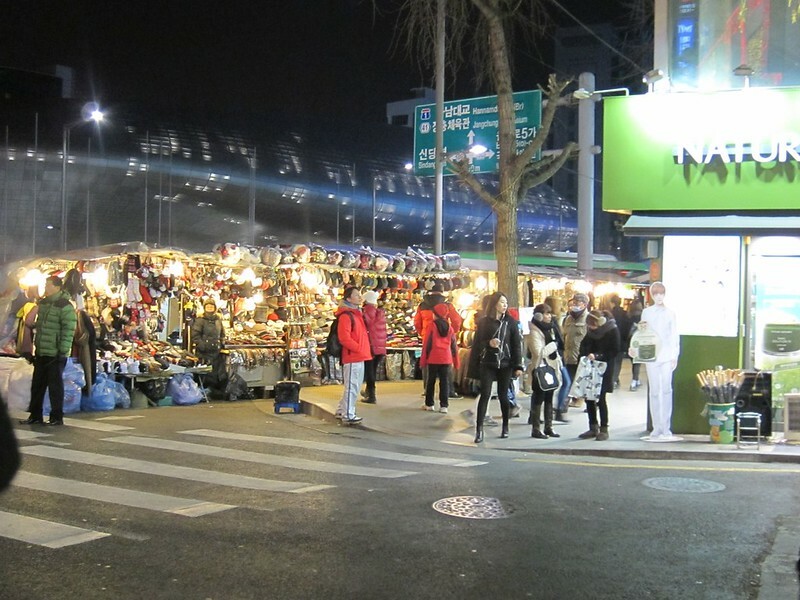 The Hongdae area (which is named after Hongik University) is known for its young, underground culture that provides travelers to Seoul with a unique experience. From street performers to road stalls to a never ending amount of restaurants, bars and clubs, Hongdae has almost everything you want in Seoul. Cafe culture is abundant and obviously being named after a university, there are students everywhere which is what keeps this place alive. Endless amounts of restaurants and bars. Heaps of university students everywhere. A large choice of things to do at night. Fairly close to Seoul Station (6 stops by subway with a transfer). Youthful & underground culture are at best here. Close to Yeouido (6 stops by subway with a transfer). One of the better areas to go clubbing. Not too interested in nightlife and drinking. More interested in seeing temples and museums. My thoughts: Hongdae was the area I stayed in when I first came to Korea, so I will always have good memories of this place. It is fairly similar in a way to Sinchon but I believe it ticks more boxes and therefore would recommend Hongdae as the best place to stay in Seoul (unless you want to go crazy on shopping of which I would probably suggest Myeong-dong). Need help deciding where to stay in Hongdae? Below is a list of accommodation which I believe is best suited for all kind of travelers. 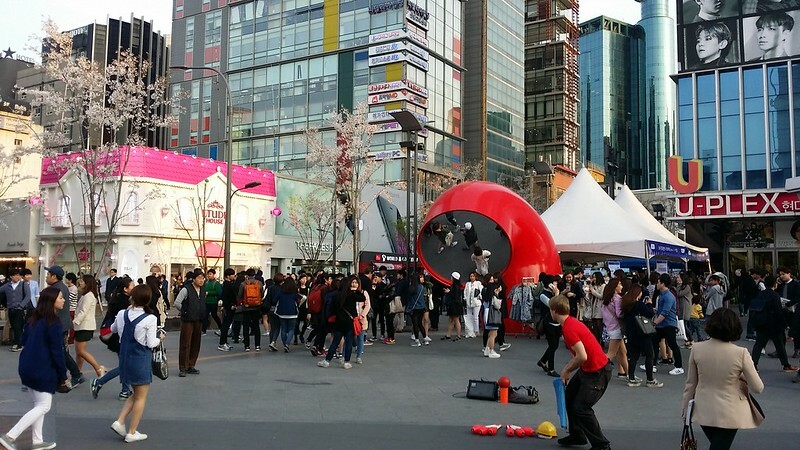 The advantage of staying in the Sinchon Area is that it is bustling day and night with young people. It has a good range of Korean and non-korean restaurants as well as providing quite a few places to sit and drink (coffee and/or alcohol). There is also some shopping to be had here (obviously not as much as myeong-dong and some other areas) if you do stay in the area, however plenty of better places if that is what you are wanting to do. It’s only 1 stop by subway from Hongdae which is great if you are planning to go out at night or simply visit during the day. A good range of restaurants and bars. Lots of entertainment available close by. Fairly close to Seoul Station (5 stops by subway with a transfer). Close to Yeouido (7 stops by subway with a transfer). 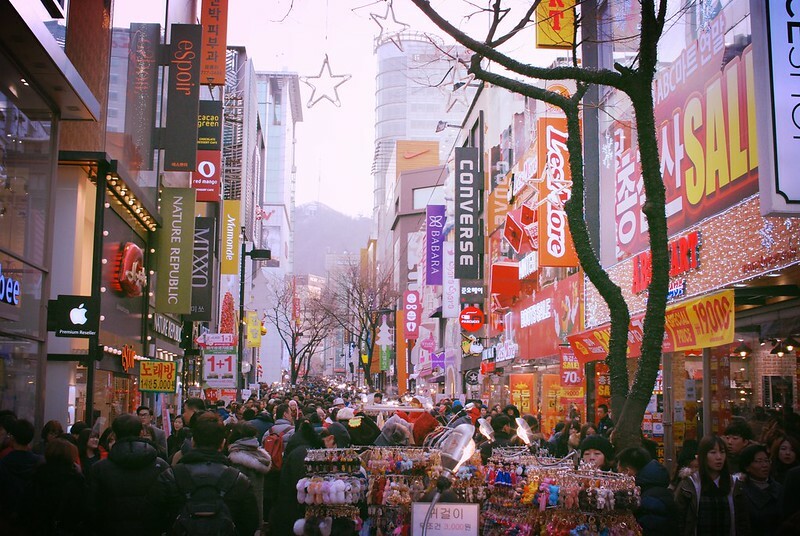 Need help deciding where to stay in Sinchon? Below is a list of accommodation which I believe is best suited for all kind of travelers. Let’s be honest, most people (including myself) only became aware of the Gangnam area because of Psy’s song, which is totally fine. The first time I visited Gangnam was only a few months after the song came out and I wanted to check out what was there. Being in an up-market area, having places like Apgujeong rodeo street, Bongeunsa Temple, Garosu-gil and numerous clubbing venues make it somewhat appealing, however being relatively far from other major sites leaves it in the half-day trip for me. Coex Mall is located here. Some high-end clubs (if that is what you are into). It is not centrally located to the major sites in Seoul. If you’re not that keen on shopping, I would stay elsewhere. My thoughts: Gangnam is not a bad area to visit but for what I am looking for in Seoul, it doesn’t quite meet my criteria and would happily stay in another area (Hongdae, Sinchon or Myeong-dong) that is more centrally located and provides easier access to cultural sites, restaurants and other numerous activities. Need help deciding where to stay in Gangnam? Below is a list of accommodation which I believe is best suited for all kind of travelers. This area (Dongdaemun Market in particular) has over 26 shopping malls with over 30,000 specialty shops, so in terms of shopping, this is a place worth visiting. This is the home of wholesale shops ranging from shoes to jackets to socks to leather goods. It is divided into 2 sections, 1 being Retail shops and 2 being Wholesale shops which are separated by Dongdaemun Stadium. Cheap wholesale goods at your doorstep. Close to Gyeongbokgung Palace (4 stops by subway with a transfer). Close to Gwangjang Market (1 stop by subway). Close to Myeong-dong (3 stops by subway). Not a good variety of restaurants compared to other areas in Seoul (Hongdae / Myeong-dong / Sinchon). Not a whole lot of nightlife within walking distance (Bars etc). My thoughts: I stayed in Dongdaemun the second time I was in Seoul as I only had a few nights and wanted to get quite a few things from the markets there, which worked out very well. I do think if it is your first time to Seoul and especially Korea, Sinchon, Hongdae or Myeong-dong would be better choice. 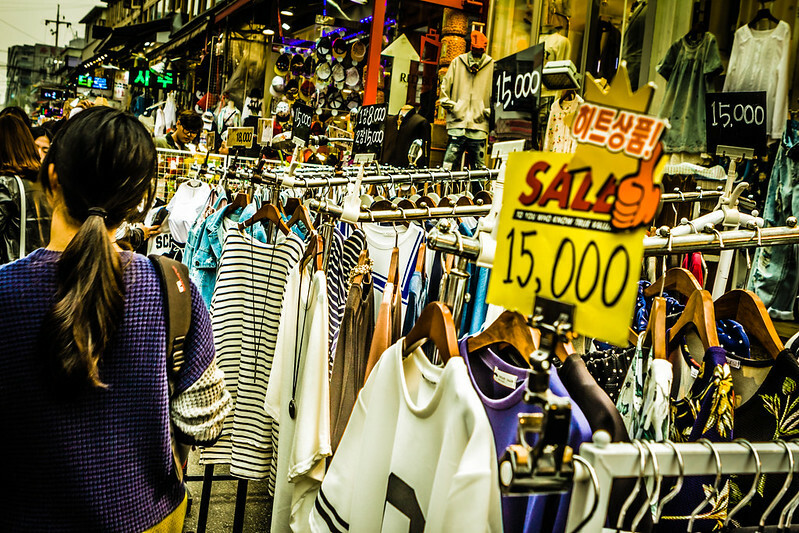 It serves a purpose and to be perfectly honest, it is only a few stops away by subway from Myeong-dong so that would be a better choice if shopping is your main reason for visiting Korea. Need help deciding where to stay in Dongdaemun? Below is a list of accommodation which I believe is best suited for all kind of travelers. Other areas which I didn’t include that you may want to consider are Itaewon (foreigner friendly area), Insadong (touristy area for merchandise), Yeouido (Business District) and Yongsan (next to Seoul Station). your site is very helpful with thoughts. I’m planning to travel Korea by next year, do you mind to give us some more infos about transportations? for example were planning to stay in Myeong-dong for 10 days we can stay over in one place right? and its like everyday were just going to visit some places, like dongdaemun, sinchon ,itaewon, etc. How is the transportation process ?and how much is the fare per travel or station?Do you have idea if we can buy tickets for unlimitted rides or something worth it for traveling everyday to places? Hope you reply. Thanks a lot. Transportation is very simple and convenient in Korea (especially Seoul). I would buy a T-Money card (some helpful information here) which you can load on money and then for every trip you make on the subway and buses, just swipe your card. Any money that is left at the end of your stay you can simply get a refund at most convenience stores (GS 25, CU, 7-Eleven, Mini Stop, With Me, Buy The Way) that has the T-money logo. As you are staying 10 days, I would load about 15,000 won and see how that goes. You can also see the price of fares HERE (Taking the Subway is 1,250 won). Myeong-dong shops are usually open from 10am to 10pm-11pm (some stores may open later but most of the big retail stores close at 10-11pm). In Dongdaemun they open from 10am until 5am the next morning, so plenty of time to shop. For subway and buses, I would buy a T-Money card (some helpful information here) which you can load on money and then for every trip you make on the subway and buses, just swipe your card. Any money that is left at the end of your stay you can simply get a refund at most convenience stores (GS 25, CU, 7-Eleven, Mini Stop, With Me, Buy The Way) that has the T-money logo. I decided to stay in Dongdaemun rather than Myeongdong (love shopping) because many of the stores at Dongdaemun are open until 3-4 AM, which is far past when the subway closes. Hi, thank you for your information. We are food lover and plans for 10 days 9 nights trip to Seoul. Initially plan to stay near Hongik University Station for 4 days, 5 days near Jungno-gu. As we prefer the area of stays are in the foodies area – walkable, and plan to includes one area to stay. May I know which area is famous for good food? Thanks. If you really love food, I would stay near Jongno 5-ga Station 종로 5가역 as it is very close to Gwangjang Market (광장시장) which is famous for its food. It is also close to Dongdaemun and Insa-dong (other popular tourist places). 서울 menas Seoul. 맛집 means delicious restaurant. I am going to Seoul in the end of March next year, bringing youths who are interested in kpop. I’m trying to find web-pages where I can purchase tickets for concerts or TV-shows, but can not find anything. Do you have any suggestion as for where I can turn to make this happen?